530 Chain Conversion for 5 speed Sportsters through 2003! 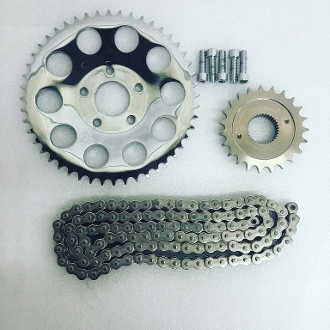 We have been asked for a 530 chain conversion so here it is! We use a PBI front sprocket with the proper offset to clear up to a 150 tire on a stock width wheel and the correct rear dished chrome steel sprocket so they line up perfectly. Includes a high quality o-ring chain and master link for long life. These will be the easiest to fit and will work with stock swing arms bikes as well as our hardtail kits. Inlcludes proper length hardware for the rear sprocket and uses your OEM lock ring on the front. 1991-1993 kits include the late model spacer kit so they come with everything you need. NOTE: If you are running a wheel that is different that stock, order the kit for the year of wheel you are using.